Beautiful Well Maintained MOVE IN Ready Home! Enjoy Open Floor Plan with Vaulted Ceilings and Lots of Windows for Natural Sunlight. Custom Maple Cabinets & Hardwoods along with Granite Countertops & Island enhance the beauty in this Kitchen. Maintenance Free Deck with walkout from kitchen is sure to please for summer entertaining & bbq's. Upper Level Master Bedroom with Master Bath includes whirlpool bath and separate shower with dual vanity for busy mornings. 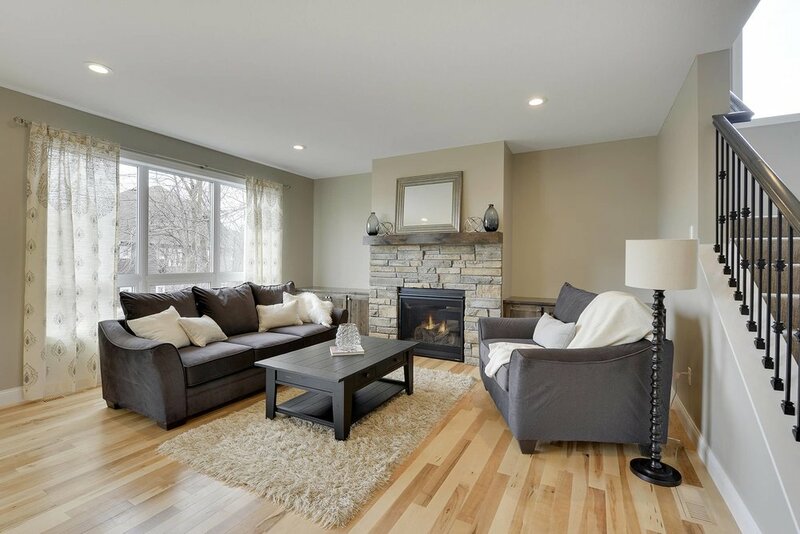 Lower Level Family Room is perfect place to relax and unwind with the gas fireplace. Enjoy walkout concrete stamped patio and large landscaped yard perfect for kids & pets. Great Neighborhood & Area, Close to Shopping & Freeways. Shakopee is located southwest of downtown Minneapolis. Sited on the south bank bend of the Minnesota River, Shakopee and nearby suburbs comprise the southwest portion of Minneapolis-Saint Paul, the sixteenth-largest metropolitan area in the United States. The river bank's Shakopee Historic District contains burial mounds built by prehistoric cultures. Shakopee boomed as a commerce exchange site between river and rail at Murphy's Landing. Once an isolated city in the Minnesota River Valley, by the 1960s the economy of Shakopee was tied to that of the expanding metropolitan area. Significant growth as a bedroom community occurred after U.S. Highway 169 was realigned in 1996 toward the new Bloomington Ferry Bridge. The city is known for the Valleyfair amusement park and the Canterbury Park racetrack. The Shakopee district serves more than 8,000 students in Shakopee, Savage, Prior Lake, and the Jackson, Louisville, and Sand Creek Townships. Our district is located in one of the fastest growing suburbs in the Twin Cities. Our Mission: Shakopee Schools, in partnership with our community, will educate lifelong learners to succeed in a diverse world. Spirit of Brandtjen Farm is a unique residential neighborhood that fosters a true sense of community. “Spirit” blends its rich history as a dairy farm with beautiful new homes on tree-lined streets designed to preserve the beauty of nature. The Brandtjen family dairy barn, restored with original California redwood, serves as the community center where neighbors frequently socialize with friends and family. “The Barn” community center offers a full kitchen, gathering spaces, fitness center, and outdoor swimming pool, and hosts many neighbor-organized events from book and bridge clubs to swimming classes and Yoga at the Barn. Spirit’s newest amenity, “The Granary,” is a second community center equipped with an exercise facility, gathering room, outdoor swimming pool and neighborhood playground. Homesites are situated to enjoy the abundance of open green space, lakes, wetlands, and wooded areas, all linked by miles of trails. Tree-lined sidewalks encourage front-porch living, and residents enjoy numerous outdoor amenities including picnic areas, fire pits, community garden, sand volleyball court, basketball court, horseshoe pit, and playgrounds. The Spirit neighborhood is home to East Lake Elementary School and is close to grocery stores, shopping, dining, recreation and entertainment. Homeowners in Spirit of Brandtjen Farm are part of a community association. New Construction One Level Living Townhome by USA Builders. High End Quality Craftsmanship and Attention to Detail on this Model Unit. Enjoy Open Floor Plan, 12ft Ceilings, Sun Room with walkout to deck, Large Master Suite with Vaulted Ceilings, Amazing Master Bath (separate soaker tub & tiled shower) Gourmet Eat In Kitchen with Upgraded Appliances, Custom Cabinets with soft close doors and Beautiful Birch Hardwood Floors. Lower Level is finished! Huge Storage Room. Located in close proximity to both downtown St. Paul and downtown Minneapolis, West St. Paul provides unbeatable accessibility, thriving commercial and industrial districts, great residential neighborhoods, an outstanding park system and excellent schools making West St. Paul a great place to live, work and play. West St. Paul is a first-ring suburb located just minutes from downtown St. Paul, Mall of America, Minneapolis/St. Paul International Airport, Holman Field (downtown St. Paul Airport), Minnesota State Capitol, Science Museum of Minnesota, Ordway Theater for the Performing Arts, the Xcel Energy Center and much more! West St. Paul is just a 20 minute drive from downtown Minneapolis, home of U.S. Bank Stadium, Target Field, Orpheum Theatre, Walker Art Museum and many more of Minnesota’s landmarks. West St. Paul is home to a number of traditional schools for all ages as well as other unique education opportunities. Part of Independent School District 197 is Garlough Environmental Magnet School, a unique school that educates with an emphasis on science, technology, environment and math. Garlough E-STEM sits adjacent to West St. Paul’s Garlough Park which gives children the opportunity to learn about nature first hand. Garlough is also connected to Dodge Nature Center through an underground trail tunnel. Dodge Nature Center has 460+ acres of prairies, hardwood forest, lakes, wetland, miles of open hiking trails, a working farm, orchard, bee apiary, and a variety of animals to discover. It is the mission of the nature center to provide exceptional experiences in nature through environmental education. Over 59,000 nature experiences are offered annually: day visits, events, programs for all ages, camps, onsite preschool, school outreach, field trips and more. New Construction One Level Living Townhome by USA Builders. High End Quality Craftsmanship and Attention to Detail on this Unit. 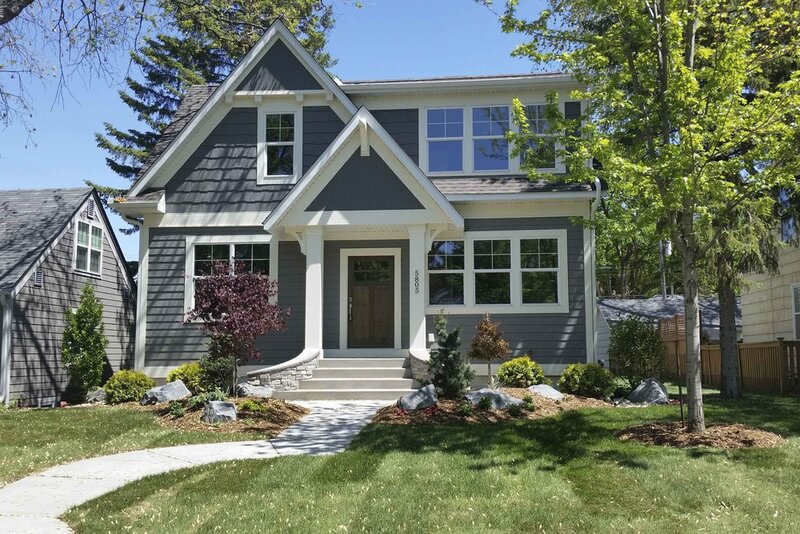 Enjoy Open Floor Plan, 9 ft Ceilings, Sun Room with walkout to deck, Large Master Suite with High Ceilings, Amazing Master Bath (separate soaker tub & tiled shower) Gourmet Eat In Kitchen with Upgraded Appliances, Custom Cabinets with soft close doors and Beautiful Birch Hardwood Floors. Lower Level is finished! Huge Storage Room. Welcome to the Fulton neighborhood. Located in Southwest Minneapolis, the Fulton Neighborhood offers the Best of City Living for residents and visitors alike. Our beautiful natural setting on the southeast side of Lake Harriet offers numerous recreational opportunities, both around the Lake and on Minnehaha Creek, which runs through the neighborhood. Fulton also offers a wide array of independent, unique businesses, including restaurants, coffee shops and retail stores. We support our local businesses through exterior improvement programs, event partnerships and collaboration with the Southwest Business Association, our area business association. The Fulton Neighborhood Association is an all-volunteer group, formed to facilitate neighborhood communication, build community, drive neighborhood improvements and represent the neighborhood with the goal of making Fulton the best neighborhood possible. Neighborhood residents, businesses and institutions are always invited to participate in association-planned activities. Located in School District #1 City of Mpls Schools promises an inspirational education experience in a safe, welcoming environment for all diverse learners to acquire the tools and skills necessary to confidently engage in the global community. This Top of the Line Remodel by GroundUp Development will leave you Impressed and wanting to show off your New Home!! Custom New Gourmet Kitchen that is the Heart of this Home, entertaining is welcomed here! Huge Private Master Suite with Master Bath on the Upper Level is your gateway getaway when you need peace & quite. Lots of room to get creative with. 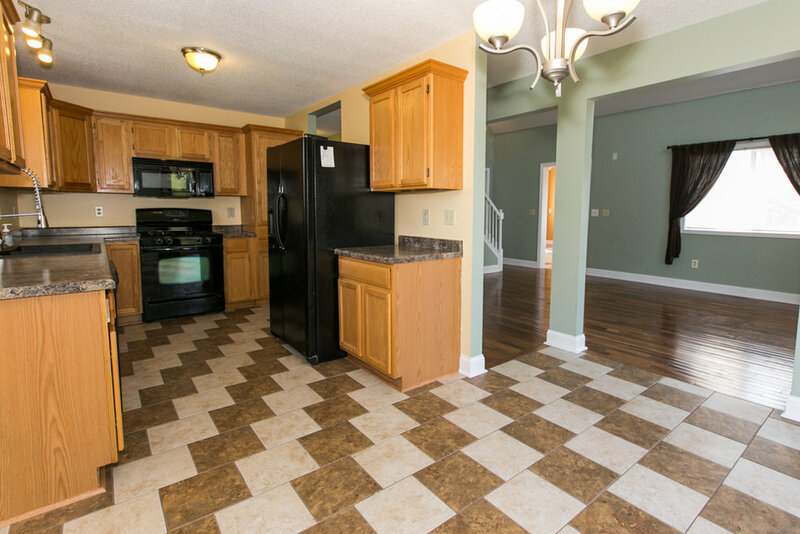 Refinished Hardwoods, New Bathrooms and Finished Lower Level are sure to please! Still time to change Selections!! Build your Masterpiece in the "Morningside Neighborhood" of Edina. Plenty of Time to Create & Customize your own Concept -- Bring your own ideas and make this EHR Construction home your own. When Mick Jagger and Keith Richards wrote the words, “You can’t always get what you want” in 1969, somehow I don’t think they saw 4306 Oakdale Avenue, Edina coming. Sure, the Rolling Stones got a lot of things right. But they certainly missed the mark on this one. In North Edina, nestled in the sought-after community of Morningside, is an oversized 64' x 140' plot of land just waiting to bring your dreams for the perfect home to life. Situated in one of the most prominent, high-end areas of Minnesota and surrounded by luxury 50th and France shopping, dining and recreation, is the place where all your household dreams will come true. Is your style more modern and industrial? Or do you prefer adding vintage touches to your home? Or is classic and traditional more your style? No matter what, every square inch of this 4200 square-foot home can be customized to your liking. From classic wainscoting to modern steel, brass and rustic wooden floors. Your wish is our command. We’re talking about a one-of-a-kind masterpiece your neighbors will be kicking themselves for not investing in when they had the chance. The chef-style, open concept kitchen was crafted with the modern socialize in mind. Everything from double inset ovens to an extended island that both triples your counter space and serves as a built-in bar. Creating your own in-house Pinstripes. Whether you want to make homemade Pad Thai from scratch, serve up a family style fajita bar on Friday nights or just have extra space to put together this week’s meal from Hello Fresh, in this cutting edge kitchen you can do it all. And you can do it in style. Just imagine hosting wine and cheese nights or Easter brunch in your own eat-in-kitchen. Your guests will have trouble choosing what custom touches to comment on first. Your kids will finally be eager to invite their friends over for that sleepover. You'll even find them coming home early Friday so they don’t miss out on Friday game nights at home. With the rents (short for parents). Also, did we mention the customized, choose-your-own-adventure recessed lights? Or the option to build your own breathtaking backsplash? Or the gorgeous summer evenings you will enjoy on your very own roof- top deck? Perfect for weekend BBQ’s, 4th of July parties or just another Saturday night on the grill, the rare added feature of a roof-top deck creates an instant indoor/outdoor living space you can enjoy almost year-round. Watch your kids play for hours on a Saturday from the comfort of your deck perched above the yard, or invite your in-laws over and watch their jaws drop as you serve them mimosas and frittatas on your outdoor oasis. When winter comes and the weather chills? There is even more to enjoy. Gather friends and family around your customized fireplace, the ideal central hangout for Thanksgiving dessert, Christmas hot toddies or hot chocolate on a cold January night. Spend hours swapping funny stories of holidays past. Or, sing along as the local pianist play a few of your favorite holiday chords. After the holiday meal is served and desserts are savored by the fire, your guests will be content to cozy up in one of the many spare rooms upstairs. There’s plenty of room for everyone to stay awhile. Meanwhile, hidden away in your master bath, you and your loved one can warm yourselves in the large soaking tub made for two. Enjoy hours in your spa-like master suite - reveling in the comforts of home and family you have worked so hard for all these years. You deserve it. You earned this. You are home. The best part, you can customize each cutting edge feature in a style all your own. Move over Joanna and Chip Gaines - we’ve got more in store for this home than you’ve ever seen on HGTV. Also, did we mention this Shingle-Style Nantucket layout is available in a 5-Bedroom, 4-Bath floor plan? Forget the Ramada. Give your friends and family their own 5-star getaway, where even small trips to the bathroom will feel like luxury living. Each detail is hand-crafted to delight and amaze. It’s the perfect “Ken and Barby” home you have been dreaming of - in the kind of neighborhood even Mattel couldn’t imagine. It all starts with Edina's award-winning school district - among the top 5 in the entire state of Minnesota! Known for innovation, technology and high college entrance rates, rest assured your kids are in the very best hands here. But they’re not the only ones. From the monthly art exhibits at Margaret Foss Gallery to Interlachen Country Club, you’ll have plenty to do outside of Minneapolis. But when you do want to take in the downtown experience, commuter roads and highways are just minutes away. Morningside is Edina’s first-ring suburb offering your family a first-rate kind of life. Add to that a custom-built, masterpiece called home, and we know you’ll never look back. You see, some people are just content to live in or near Edina, enjoying the shopping, dining and soaking up the many other benefits of living in a sought-after town. Others understand that dream living doesn’t end at your front door. You need a dream home to make the lifestyle complete. Have you always dreamed of building your own home? A home with everything you could ever want? A one-of-a-kind masterpiece your neighborhoods can’t stop telling their friends about? If you can answer “Yes” to any of these, then this Shingle-Style Nantucket, Edina, MN new-construction home is perfect for you. Pristine Home with New Upgrades that is Move In Ready. New Roof, Siding, Carpet, Paint, Dishwasher & Water Heater. 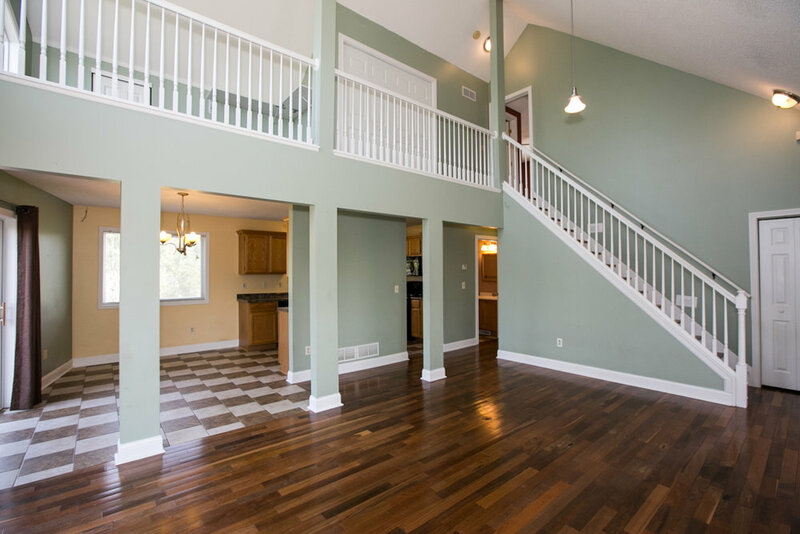 Amazing open floor plan with vaulted ceilings that has the "WOW" factor! Eat In Kitchen with walkout to oversized deck, perfect for entertaining. Lower Level is finished with Family Room, BD & 3/4 Bath. 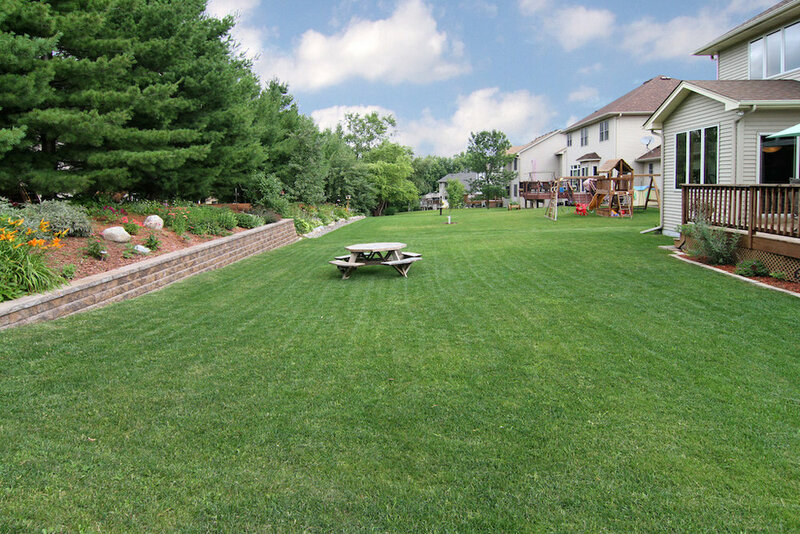 Enjoy the walkout to the back yard which is perfectfor kids & pets and also has path access to the River Park Trails. Great Neighborhood, Close to Shopping & Freeways. We asked our Sellers -- What do you love about your home and why would a potential Buyer be excited to live here? 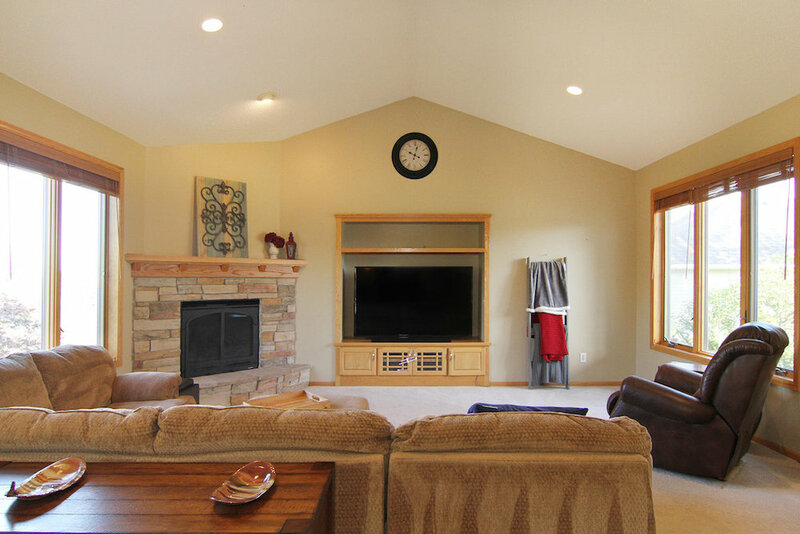 "Our home is Move In Ready and has the "WOW" factor with the oversized Living Room with vaulted ceilings & fireplace. The back yard view while sitting on our deck is gorgeous and private. 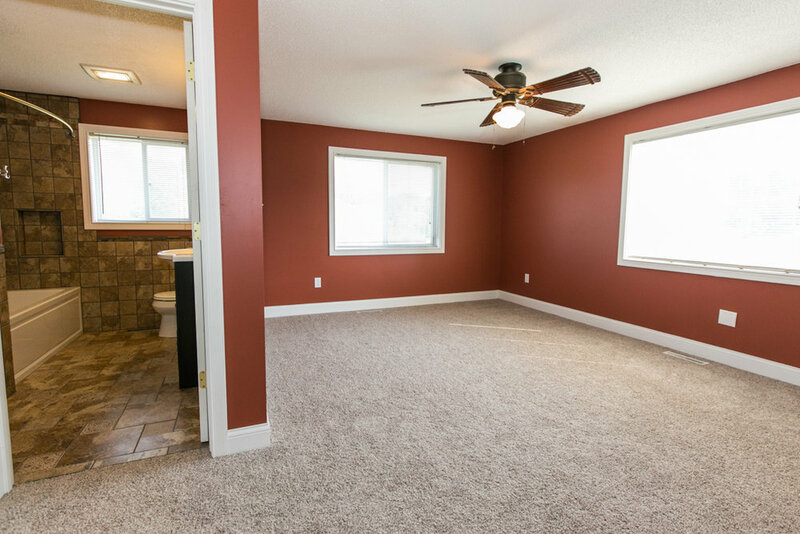 We love our finished walkout basement, its perfect for kids & pets to go out to the backyard to play." What do you like about the Community or Neighborhood? "We have direct access to the 3 Rivers Trail System, it runs through our backyard. For shopping & dining Arbor Lakes is very close to our area. There is Park & Ride access for the downtown commuters also." What are the Neighbors like? Are there any children in the neighborhood? "This neighborhood has a wonderful mix of young families with kids. Everyone is kind and very watchful as there are lots of strollers, bikes and children playing all the time. Great neighborhood for trick or treating!!!" What is the saddest part of leaving your home, what will you miss the most? Hands down we will miss our neighbors!! We will miss sitting on our deck in the summer and entertaining family & friends. Finally, our main floor living area -- we love that it is so open and inviting, the vaulted ceilings & fireplace are an added bonus! Fabulous Remodel -- Everything New Top to Bottom!! Move In READY --Beautiful New Kitchen with SS Appliances, Hardwoods, Dining Area & Fireplace -- Open Floor Concept with Vaulted Ceilings makes entertaining a pleasure. Huge Master BD with Full Master Bath. Lower Level is a walkout with family room, 3 BD's and 3/4 bath. Walkout is perfect for kids & pets. Enjoy nature at it's finest on this 1.5 Acre property. Country Living within City Limits. New Roof, furnace, water heater, washer & dryer. Upper Master Bedroom with Full Bath and Loft area perfect for office, exercise or sitting room. Show - Quick Closing Possible. Meticulously Maintained Home that is Move In Ready! Enjoy open floor plan, 2 sided fireplace, Eat In Kitchen with Breakfast Bar, Updated Light Fixtures & Fresh Paint. 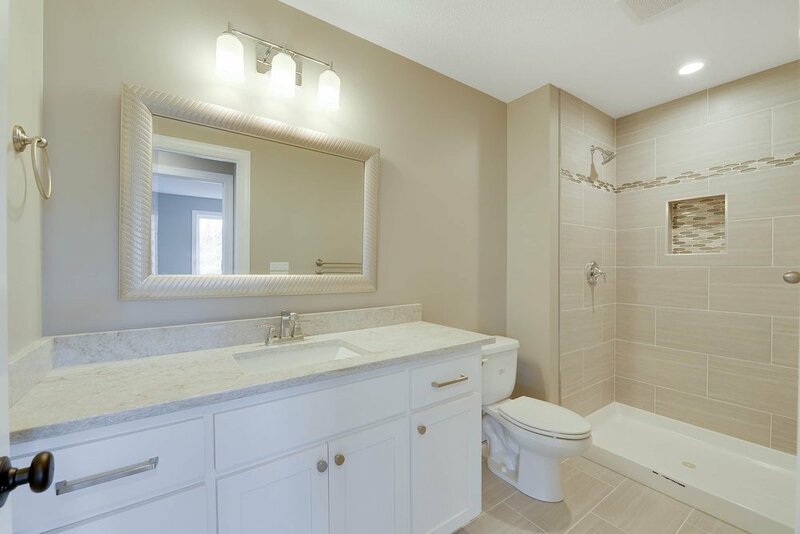 Relax upstairs in Master BD with Private Bath, Spa tub & separate shower. 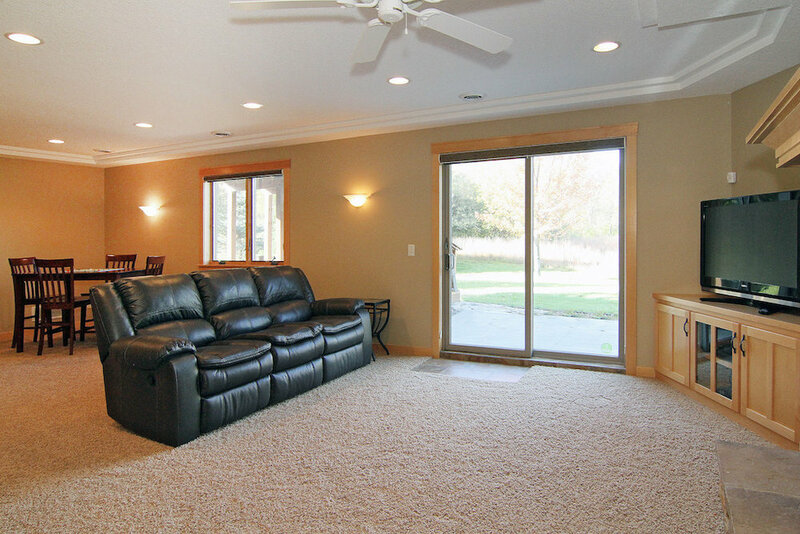 Lower Level has perfect setup for amusement/family room -- great for entertaining. Sit out on the deck and enjoy the rest of summer, beautiful landscaped yard with flowers/perennials is a bonus. Great Neighborhood, Close to Everything!! Here are a couple questions we asked the seller about their home that we wanted to share with you. What do you think the next buyer will enjoy most about your home? 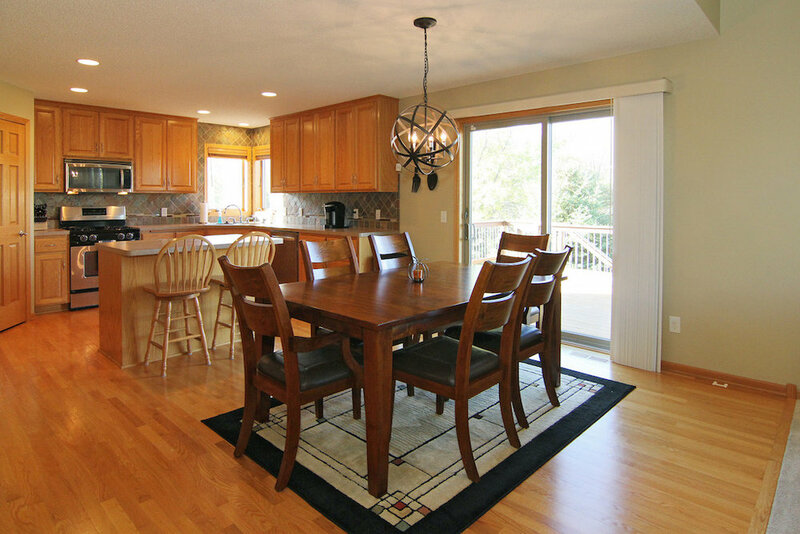 "We love the open floor plan of our home, it flows well. The 2 sided fireplace is amazingand very cozy in the winter months. We love the fact that it's is in the kitchen, very soothing to cookand eat dinner by. Lower Level Family room has been wonderful for entertaining with family & friends"
What is the neighborhood/neighbors like? "We have the Best Neighbors!! Very friendly & social -- lots of kids in our neighborhood, all different ages"
What do you like best about your community? Any special attractions? Any schools you would recommend? 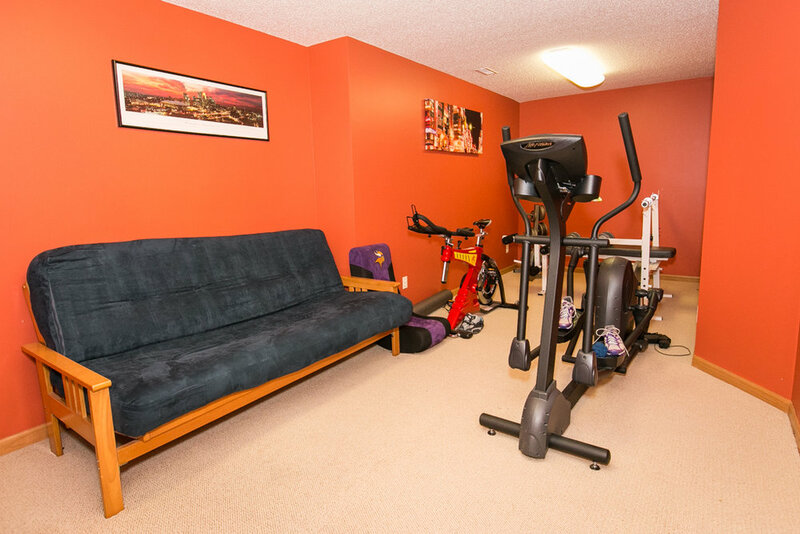 "Convenient location to everything (shopping, schools, highways) We love the fact there are walking /biking trails close by. Amazing golf course up the street that has great dining! Excellent Rush Creek Elementary is close by"
Maple Grove, MN continues to be one of the fastest-growing communities in the Minneapolis Metro Area. City Services are keeping pace with residential and commercial development needs. A wide array of amenities as well as acres of park land and miles of trails are available for the enjoyment of Maple Grove, MN residents. Maple Grove City Council assures their residents future growth and the quality of life will always be maintained. Located in School District #279 Osseo Area Schools is an award-winning school system that inspires and prepares all students with the confidence, courage, and competence to achieve their dreams; contribute to community; and engage in a lifetime of learning. ISD 279 is the fifth-largest school district in the state, serving all or parts of Brooklyn Center, Brooklyn Park, Corcoran, Dayton, Maple Grove, Osseo, Plymouth, and Rogers. The district is known for excellence in areas ranging from academics and arts to sports and finance. This property is very close to the "Rush Creek Elementary School"
Welcome Home to 18072 78th Place N in Maple Grove, MN. This well established development & neighborhood is a perfect place to raise a family. Exterior includes: High quality LP Siding that is maintenance free, energy efficient vinyl windows, asphalt driveway and a large 3 car attached garage for vehicles, tools & toys. As you enter into the Foyer gleaming maple hardwoods greet you throughout the main floor. The Open Floor Plan captures the sophisticated style of this home. 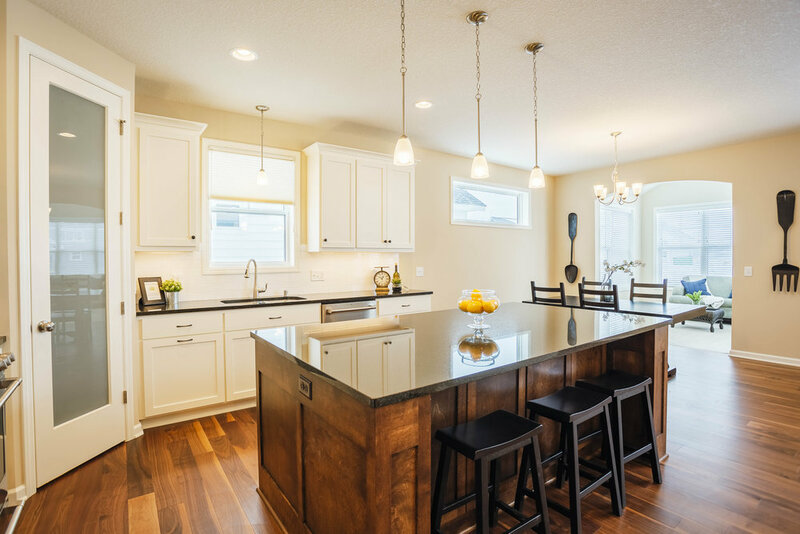 Enjoy the Eat In Gourmet Kitchen with Quartz Center Island Breakfast Bar, Gas Cook Top, Stainless Steel Appliances, Soft Close Drawers and Double Ovens are sure to please any cook in this kitchen! 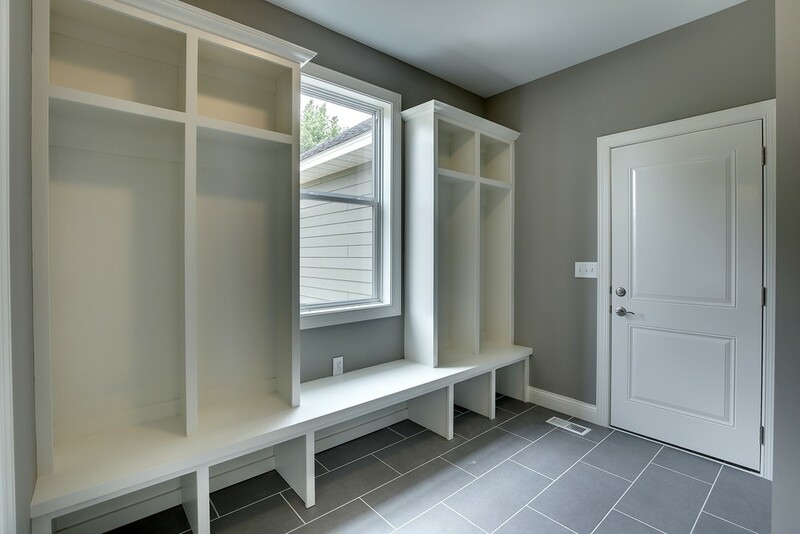 A private office and a mud room with custom built lockers for storage was designed on first floor for convenience. Relax and Retreat upstairs to the large master bedroom & spacious private master bath. 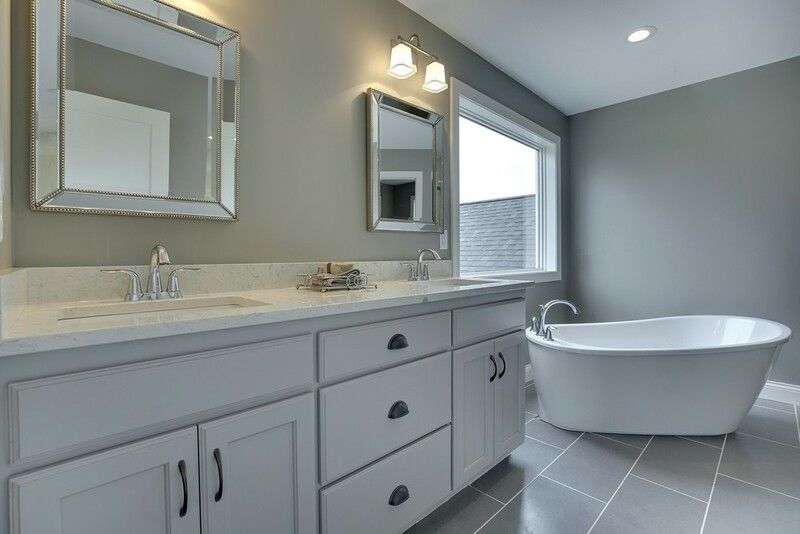 Large soaker bath tub and separate shower is the added touch for relaxing after a long day of work or play. Three additional bedrooms, full bath & upper level laundry round out everything you will need on this upper level. Tons of room and closets for everyone to enjoy. Finished lower level family room will be the perfect area to entertain or "just hang out" Perfect for kids or teenagers to have their own space. Trendy Light Fixtures, Warm Color Palette, New Carpet & Hardwoods enhance every room to give this home the perfect comfortable "at home" feel. 7909 RANIER LANE N, MAPLE GROVE, MN 55311 – SOLD! 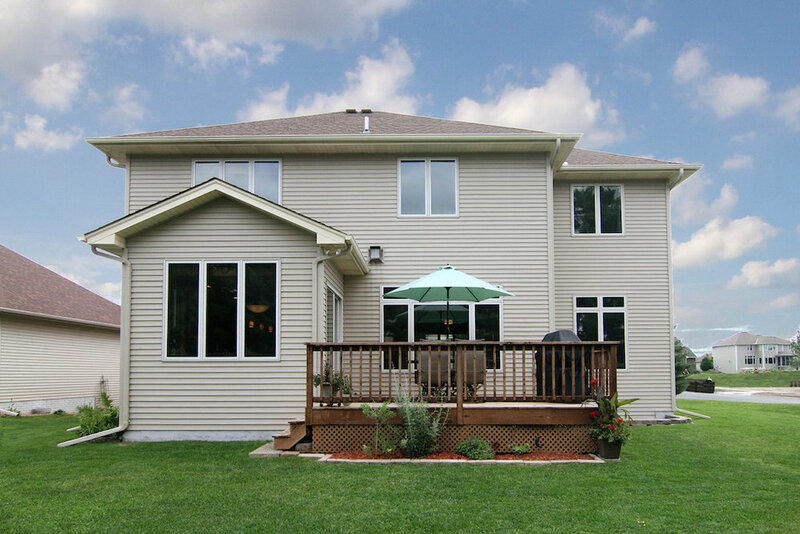 Announcing our exclusive New Listing of 7909 Ranier Lane N. in Maple Grove Minnesota. This exquisite new construction home with a contemporary interior design, gives this home a warm, relaxing first impression. The exterior has high quality LP Siding that is maintenance free, newly landscaped yard, energy efficient vinyl windows, asphalt driveway and a 3 car attached garage. 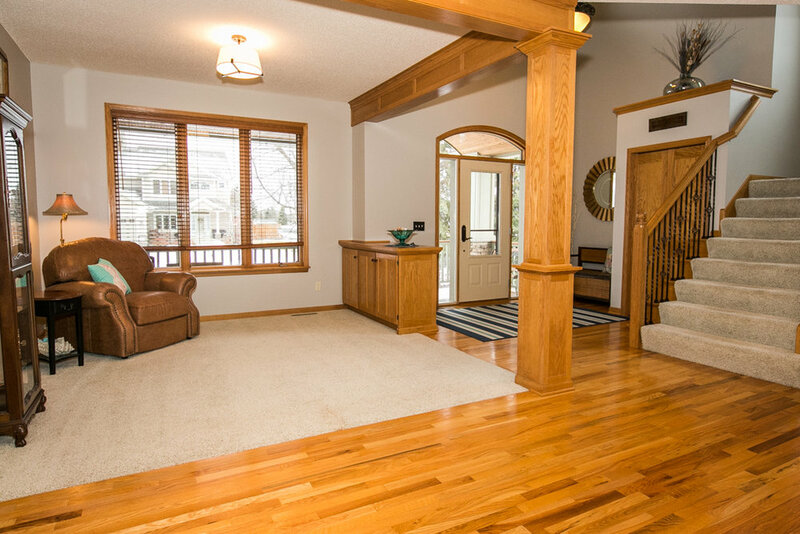 As you enter in the gracious entry foyer maple hardwoods are throughout the main floor. A separate & formal dining room is right off the living and kitchen area. 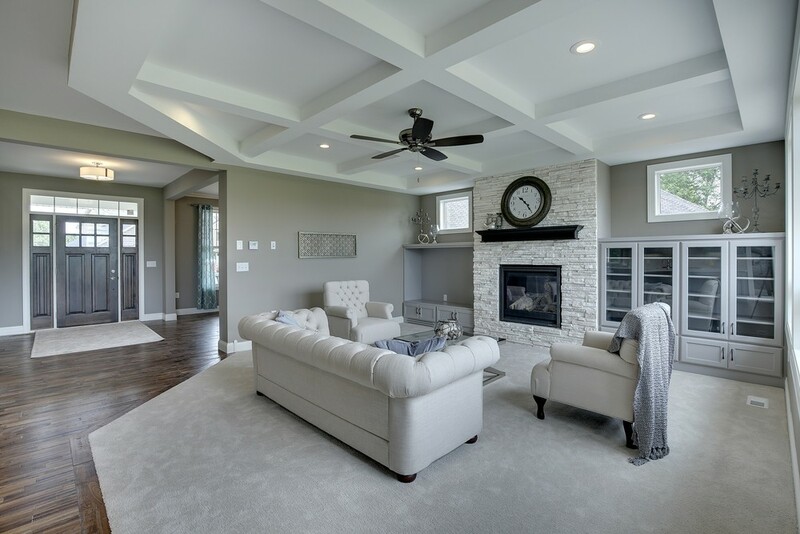 Open Floor Plan with coffered ceiling is surely going to catch the attention of everyone. This unique idea captures the sophisticated style of this home. 2 Ledgestone Gas fireplaces are the added comforts to both the living and family rooms. The Eat in kitchen is one of the main attractions with its Quartz Center Island breakfast bar. Gas Cooktop, Bosch Stainless Steel Appliances, Soft Close Drawers and double oven are sure to please any cook in this kitchen! 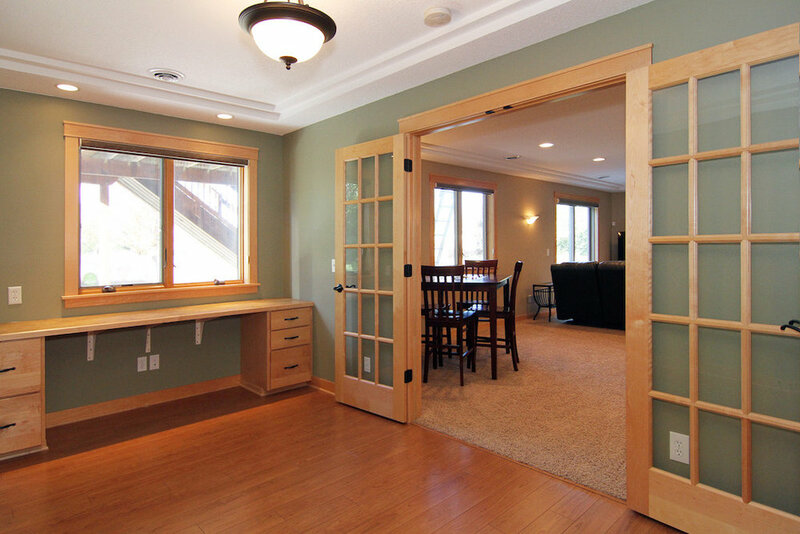 Off the main room is a private den/office and a custom mud room with lots of room for storage. Relax and Retreat upstairs to the master bedroom & private master bath. Crisp and clean color palette that match the decor perfectly. 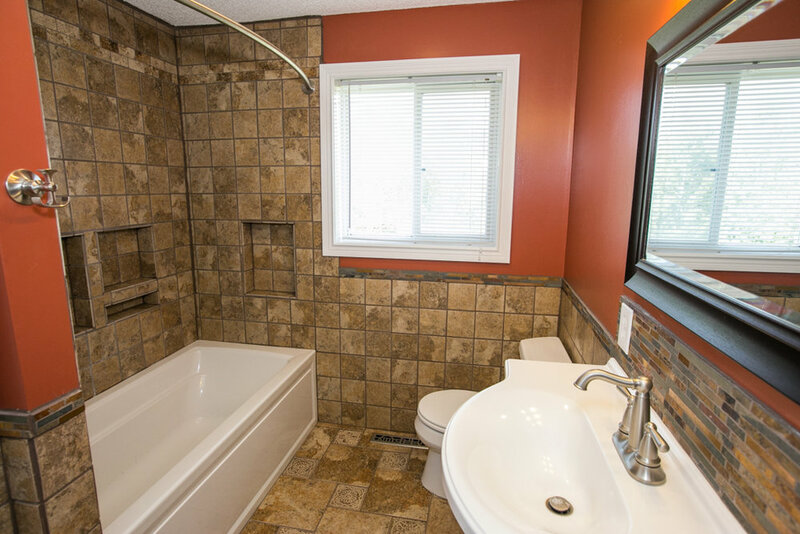 Large soaker bath tub and separate dual shower are the added touch to this master bath. 3 other bedrooms, full bath, upper level laundry and a loft are all on this upper level. Lots of room and closets for everyone to enjoy. Finished lower level family room is the perfect area to entertain or "just hang out" Complete with a wet bar, 3/4 bath, lower level bedroom and cozy fireplace. Great Home, Great Area & Great Price makes this home a perfect choice for your family. Please call me directly at 952-223-0999 to set up a private showing. Maple Grove continues to be one of the fastest-growing communities in the metro area. City Services are keeping pace with residential and commercial development needs. A wide array of amenities as well as acres of park land and miles of trails are available for the enjoyment of Maple Grove residents. Maple Grove City Council assures their residents future growth and the quality of life will always be maintained. Located in School District #279 Osseo Area Schools is an award-winning school system that inspires and prepares all students with the confidence, courage, and competence to achieve their dreams, contribute to community, and engage in a lifetime of learning. ISD 279 is the fifth-largest school district in the state, serving all or parts of Brooklyn Center, Brooklyn Park, Corcoran, Dayton, Maple Grove, Osseo, Plymouth, and Rogers. The district is known for excellence in areas ranging from academics and arts to sports and finance.